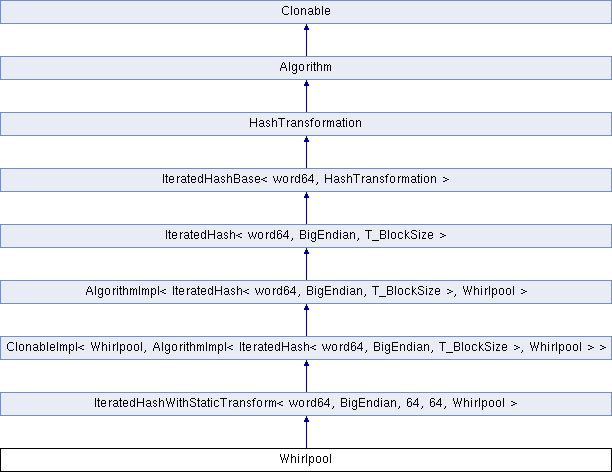 Crypto++ provides version 3.0 of the Whirlpool algorithm. This version of the algorithm was submitted for ISO standardization. Definition at line 29 of file whrlpool.h. The Whirlpool algorithm was developed by Paulo S. L. M. Barreto and Vincent Rijmen. Suboptimal diffusion matrix replaced by cir(1, 1, 4, 1, 8, 5, 2, 9). Generation of ISO/IEC 10118-3 test vectors. Bug fix: nonzero carry was ignored when tallying the data length (this bug apparently only manifested itself when feeding data in pieces rather than in a single chunk at once). Support for MS Visual C++ 64-bit integer arithmetic. Original S-box replaced by the tweaked, hardware-efficient version. Definition at line 92 of file whrlpool.cpp. Definition at line 106 of file whrlpool.cpp.